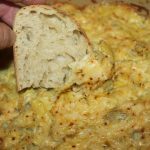 Our quick and easy artichoke dip recipe is a life saver when you need to make a crowd pleasing appetizer and have little time. Most likely you will have all the ingredients that you need in your pantry or refrigerator to be able to throw this together in a matter of minutes. After draining and chopping the artichokes, all you need to do is throw everything in an oven safe dish and heat it up. 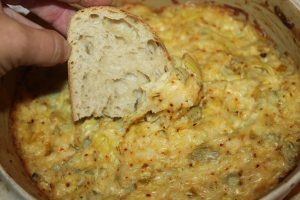 I prefer to heat the artichoke dip in the oven, however, if you do use a microwave, it can be ready in just 5 minutes. So, instead of spending extra time in the kitchen during this very busy month, spend time enjoying each other’s company with this delicious dip. After draining the artichokes, chop them into bite size pieces. Mix the ingredients together and heat . 1. Drain artichokes in a colander. 2. 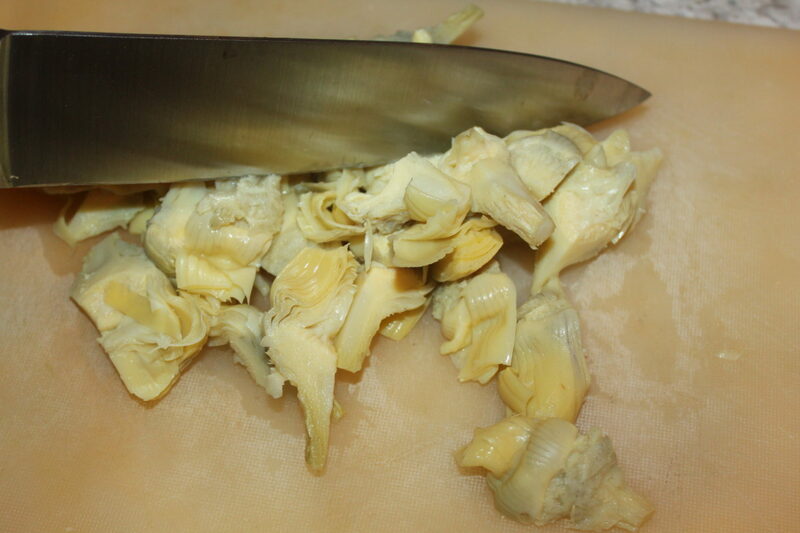 Coarsely chop the drained artichokes. 3. In an oven safe dish, mix together all of the ingredients and spread evenly in the pan. 4. Bake in a 350°F oven for 20 to 25 minutes. (Or microwave on High for 5 minutes). 5. Add salt and freshly ground black pepper to taste. Serve hot with sliced veggies, toasted baguette slices and/or crackers. To receive our Recipes, DIY and Gardening articles each week, sign up to follow the blog via email in the right hand column above, “Like” us on Facebook, or follow us on Twitter. You can also check out our new book, Growing Simple now available Here. Drain artichokes in a colander. Coarsely chop the drained artichokes. In an oven safe dish, mix together all of the ingredients and spread evenly in the pan. Bake in a 350°F oven for 20 to 25 minutes. Add salt and freshly ground black pepper to taste. Serve hot with sliced veggies, toasted baguette slices or crackers. Mmmm! 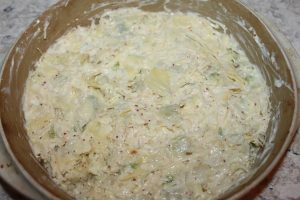 I love artichoke dip. I haven’t made it in a while, and this is a good reminder to get the ingredients and mix some up. I think I’ll leave the hot pepper out. A bit of cayenne is enough spice for me.